Recently, I had a crazy craving for peanut butter cookies. I don’t know what came over me, but it was all I could think about. So as soon as I got home from work, I set to work. Poor Penny was staring at me like I killed her best friend because she could smell peanut butter, but I wasn’t letting her have any. And per usual, I caved. Well… sort of. I’m 100% behind them and I’m happy to pay a little more for quality ingredients knowing that my money is going toward the greater good for our furry little friends. And as you can see below, Penny is an emphatic supporter as well. I wanted to try making her a new kind of treat, so I started digging around the pantry to come up with an idea. And then it dawned on me – I was making myself peanut butter cookies, so why couldn’t I just make her peanut butter cookies? 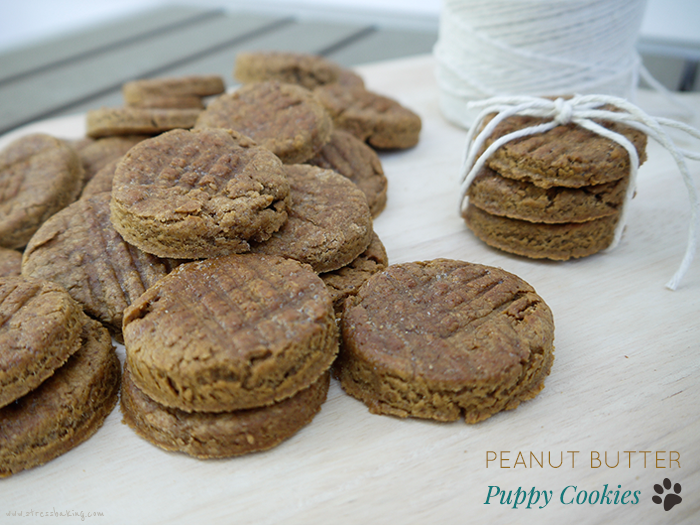 I’m sure your pup will love these as much as Penny does – let me know in the comments how they go over with your furbaby! 1) Preheat oven to 325°. 2) Beat egg with a whisk in a large bowl. Add peanut butter and one of the eggs, and whisk it all together. 3) Add flour and baking soda, and use your hands to completely combine. 4) Lay a sheet of parchment paper on your counter and dust lightly with flour to prevent your dough from sticking. Use a rolling pin to flatten out the dough to around 1/4″ thickness. 5) Using a circular cookie cutter (or the top of a shot glass), cut out as many circles as you can. Lay them out 1/2″ apart on a prepared cookie sheet (fitted with parchment paper or a non-stick silicon mat). Press the back of a fork into the top of each cookie and then press it in again at a 90° angle, making a criss-cross pattern. 6) In a small bowl, beat an egg white and add a teaspoon of water. Brush a light coat on the top of each treat, and then pop them in the oven for 10 minutes. Turn them over, and bake for another 10-15. 7) Place on cooling racks to cool completely, and then store in a closed container. You can also stick them in the freezer to keep them for longer!